New Order's fourth album, released in October 1986. Recorded at Windmill Lane Studios and mixed at Liverpool's Amazon Studios. Another Peter Saville (2)/Trevor Key design, representing a bar of zinc and its serial number. A few special editions were coated with titanium zinc. Peter Hook: "Listen to it and you can hear it has two different sides. There were battles raging on Brotherhood." Bernard Sumner: "We'd always had that balance of electronics and band stuff. I was always pushing for electronics, and Hooky was always pushing for the band stuff, which was fair enough, I think we needed the band stuff. And by luck it got tipped the band way on Brotherhood. It was a very dense album, because we'd gone a bit mad on overdubs, so it was very layered, and very dense." Peaked at #9 in the UK album charts. In 2008 the album was re-released as 2x CD Collector's Edition set, with the bonus disc containing non-album singles, 12" mixes and b-sides. Factory Australia's initial cd release was based on imported UK copies with "Factory Records Australia Import" stickers on front jewel case (as on image). 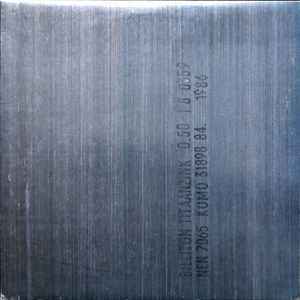 There were 3 copies of this LP with "jackets/sleeves" made from the actual metal that Peter Savile had photographed. Proof that you should never judge a "book" by its cover. Make of that what you will! If anyone has just the INNER sleeve for this I'd pay a couple of bucks plus postage for it. Doesn't have to be this exact release. What's with the dodgy new effect overlaid on the front cover? I know the original sleeve had a metallic sheen, but the weird ripple texture they introduced for this reissue is waaaaaaaay too much. The original looked like a sheet of metal; this looks like a crisp packet. A really weird decision, especially given that Rhino have proved with the packaging for the Joy Division reissues that they can pay attention to detail. The Brotherhood jacket and the singles, Bizarre Love Triangle and State of the Nation were photographs of actual sheets of metal that were delivered to Peter Saville Associates and photographed by Trevor Key. The original pressing of Brotherhood was die stamped. Die Stamping is not intended for a surface as large as the front and back of a 12" record jacket. The result was that the die stamping machine broke. I don’t recall how many jackets were produced before that but subsequently the jacket and CD booklet were printed offset. Die stamping gave it the approximate texture of the sheet of zinc. I was a designer at PSA at the time and worked on this project. Anyone know the quality of these Japanese releases? It has been widely acknowledged that the bonus disc (remixes, instrumentals and 12" versions) on this reissue was sourced from commercially available vinyl recordings instead of the original master tapes. Fans around the world noticed these faults right away and contacted the record company. Peter Hook was quoted on his Myspace page as saying the situation was a mess and blamed the record company for not sending the band advance copies to do quality control. "Warner Bros. UK, Rhino and New Order regret that the initial pressings of the Collector Editions of 'Movement,' 'Power, Corruption & Lies,' 'Low-Life,' 'Brotherhood' and 'Technique' contain some minor audio problems on the bonus discs." "We are now in the process of correcting the problems, but it should be noted that due to the age and condition of some of the original source tapes, the sound quality may vary. A further statement will be issued once the corrected product is available. At that time, the procedure for exchanging CD's will be announced. Thank you for your patience while we resolve this situation."